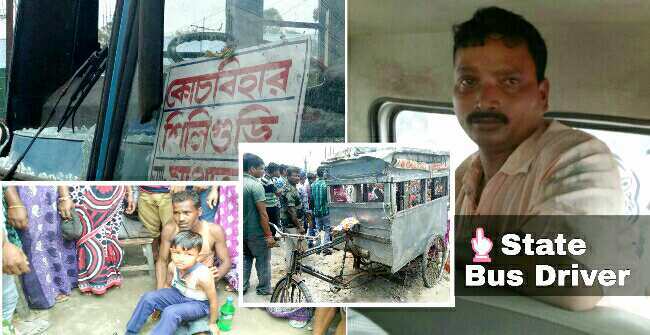 A state bus hits a school rickshaw van in full speed at Fulbari opposite NHPC near Siliguri today morning around 11am. The school rickshaw vanwala along with the kids have been injured. Eyewitnesses say these state bus drive very recklessly. Today the kids were saved after a pickup van loaded with eatables came in between the rickshaw van and the bus. Sources say if the pickup van wouldn't have been there the kids would have been mauled to death today. Meanwhile police have reached the spot and have arrested the state bus driver. The school kids and rickshaw vanwala have been taken to Medical. Locals demand that the administration should do something to these state busses. They drive in full speed and very recklessly.